With the Pennsylvania winter on its way out the door, our skin is starting to rebound, and our hair is looking less dull and lifeless, or is it? Are you constantly plagued by dry skin, lackluster hair, and a general feeling of filminess after your shower or bath? This may be an underlying symptom of a more serious issue: hard water. We’ve all been in the basements of homes and seen the water treatment systems. If you’ve ever been a guest in a home with hard or soft water, you can feel the difference between treated and untreated water. How do you tell if you have hard water, though? There are several different ways to evaluate your home to figure out if you should have a water treatment system installed in your home. 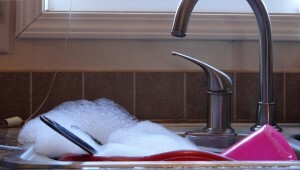 The Suds Test – Fill a water bottle with water and dish soap, then shake it up to evaluate the sudsiness. The less suds you have or the less time they last, the harder your water is. Hard water will prevent a lathering effect, as it causes a buildup of minerals in your water. Scratchy Clothes – Don’t trust your kids to evaluate whether or not their clothes are itchy, because they’re bound to complain if they don’t want to wear something. However, if your clothes feel rough and itchy immediately after washing, chances are, your water is hard. Spotty Glasses – If you’re constantly battling spots on your dishes and silverware, don’t blame your dishwasher or the dish detergent right away. Sometimes, the incidence of spots on your glasses can be indicative of hard water. Rough Hair and Skin – Hard water dries out the skin and hair in an unnatural fashion. Sometimes the winter weather will wreak havoc with both of these things, but if it continues past the chilly weather, you may be the victim of a hard water issue. Slow Drains – One of the most unpleasant side effects of hard water is the buildup of excess minerals in your pipes, causing them to become clogged more easily. If you’re noticing that water is slow to drain, hard water and mineral deposits may be the culprit. Crusty Faucets – If you feel like you’re constantly polishing the silver fixtures on your sinks and showers, you may have hard water. Hard water causes a buildup of limescale on your fixtures, making them appear to be coated with a white crusty substance. If you’re suffering from one of all of these symptoms of hard water, you may have an issue. Contact us today to properly analyze and evaluate your water, and to install a water treatment system in your home before you suffer the price with more expensive and extensive repairs to your pipes and plumbing. « What’s Up with Water Heaters?